Auto Punditz – Page 42 – Not just another automotive website! · 1) HAPPY FESTIVE SEASON! Was the salute in my previous month’s post. It stood out to be true and majority of the OEM’s are truly ‘celebrating’ the festive fervor. The increase in the diesel prices boosted the demand for the almost dead petrol cars. The decrease in the interest for car loans came at the right time and pumped the required liquidity confidence in the market at the right time. The ‘UV’olgy still had its grip and even grew this season. October was also the month of new launches – ‘Alto 800’, ‘Ssanyong Rexton’, ‘New Ford Figo’, ‘Manza Club Class’, ‘Safari Storme’ to name a few. · 2) Maruti and Resurgence seems synonymous. 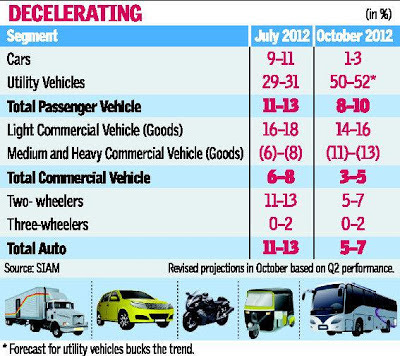 It spurted the automobile industry growth for October’12. It crossed the 1 Lakh figure (including exports) after a long interval. It recorded a 94 per cent jump in car sales during the month over the same month last year. The industry leader also launched its new Alto with a fresh ‘wave front’ design. It has already garnered over 30k bookings and the offtake numbers support the fact. Along with K10, the Alto brand had its ever highest offtake figures in past six months with 26600 numbers. The Swift family (Swift hatchback + Dzire) heralded the flag with a combined figure of 29822 units. Ertiga too jumps in the party with an ever-highest billing of 7289 cars. However, the refreshed Ritz couldn’t add any extra ‘JOY’ with its average offtake of 5389 nos. · 3) Notable performance was from Kizashi – with 35 numbers in Oct’12; it equals the combined offtake of past 6 months (35 nos from Apr’12 – Sep’12). The surge was primarily through a 5-Lakh rupee drop in its price J Also the tall blue-eyed boy performs well (13608 units) on the base of confidence in petrol cars post the diesel hike. · 4) The Estilo, SX4 & A-star are still in the dark and seem to slowly loose the sheen with time – with a meager figures of 1217, 695 & 587 units. Can a refreshed avatar change the fortunes of the aforementioned brands? Only time’ll tell. · 5) Mahindra makes waves again. Not only in sales; but in customer satisfaction levels as well. Mahindra emerges as the most improved OEM in Sales Satisfaction Index & Customer Satisfaction Index studies from J.D. Power. The effort has been well applauded with the increased customer orientation levels towards the brand. No wonder an XUV 5oo sells more than all the D-segment cars combined in the same price band. · Bolero’s take on anything attitude works in its offtake numbers as well. It has been the most consistent brand in terms of sales numbers over several months now. It tastes its best billing till date with 11071 units. Scorpio proves its mettle again with its highest offtake in this FY – 4681 units. Quanto takes the concept of ‘Compact SUV’ to the next level – with over 5k bookings it is successful in dispatching 2044 units to the dealers. · 6) Xylo & Verito figures remain average with 2044 & 1553 respectively. Can we term it as the Quanto effect? It’ll be too early to name that. · 7) Rexton is received well. With launch in only 2 cities (Delhi + Mumbai), its offtake was 80 units. With launch in many more key cities this Diwali, we can expect Rexton to surely challenge the market leader ‘Fortuner’. However, supplies of this Korean magnet needs to be assessed. · 8) The ‘trend-setter’ Hyundai also relishes in the festive hungama with its best month in this financial year. i20 slowly approaches the 10k mark – initially touted to have a fortune similar to Honda’s Jazz; this uber-cool hatch amazes everyone with its sales figures month on month! It even surpasses its younger sibling i10 in terms of sales volumes (i20 – 9058 nos, i10-8988 nos). The recently added Daytime Running Lamps adds to its long feature list and hence allows an hatch owner to enjoy the luxury features of a sedan. · 10) The neo-fluidic Elantra now adds another feather to the Korean carmaker – it consistently tops the sales in its segment (D1) with 668 units. Even the fluidic Verna set the sales chart on fire with 5050 units of offtake. · 11) The OEM that gains the most with the increase in diesel prices is Honda. With 3700 units of Jazz & 3976 units of City, Honda gets justice. We also got to see the preview of the Brio sedan (with its launch in Thailand). We can expect the OEM to create some serious ripples with its to be launched diesel-offerings in the coming months. Even the Honda City-CNG was launched in India this October. · 12) Beat takes a beating – almost de-grew by 50% month-on-month. Was this a UVA-Sail effect? Or else it was an effect of increase in diesel prices and Beat losing its advantage. Maybe both. The UVA Sail is expected to be priced less than a Swift and pose some serious threat to the iconic Swift. But with the average reviews of the Sail, its fate is totally dependent on the customers acceptance. · 13) Tata is experiencing a hard time selling its ‘once’-iconic brands. It also launched a blitzkrieg of “refreshed” indica ev2, manza club class and Safari Storme to subsidize the falling sales. Karl Slym now has a mammoth task to protect Tata’s territory – Ex: it is slowly losing its taxi share of Indica & Indigo to Etios and Liva sisters. Bolero has clearly overtaken Sumo over the years. Safari has now Duster & veteran Scorpio to dare. Aria proves to be a costly affair. · 14) Most importantly Tata Motors need ‘NEW’ product launches to revive. It has already set plans to charter product offensive strategy launch several new products in next 3-5 years. · 15) Renault seems to satisfy all its dealers with a record-shipping figure of 5406 units. It is also expanding exponentially – and is on track to achieve 100 dealers mark by the end of FY. The Scala & Pulse brands are also supporting adequately to the OEM. · 16) Nissan’s dealers decision to oppose Hover Automotive India proves to be a shocker. Nissan’s dealers are unable to understand the reason how Nissan’s partner Renault is successfully bringing in new products and supporting the viability of its channel partners. Nissan dealers have now demanded Nissan’s direct intervention rather than using an intermediary (Hover) to improve the situation. · 17) Toyota continues its dream run with Fortuner & Innova. However, its India-specific products – Etios & Liva are slowly losing their charm. Also their increasing penetration in taxi fleets points Toyota’s desperation to improve the volumes. 18) Yeti with 6 units seems to come to a natural death situation. Skoda also fails miserably to improve its Fabia numbers – 256 units only! The situation is not great in its parent company VW too. With hefty promotions and discounts – only Polo makes a mark in Oct’12. Just few dozen months back the Automotive Market was gripped by the monopoly of the entry level htachbacks. This particular segment bought in volumes and hence used to define the superiority of an OEM. Maruti Suzuki had an offtake of 38,065 numbers of Alto in March’11 – the figures of Alto had superseded the overall volumes of Hyundai’s all models combined in the particular month! (31,822 nos.). The sale figures of other entry-level hatchs just strengthened the situation (i10 – 14215 units, Wagon R – 14885 units). A surge in these numbers were supported by the fact that the First Time buyers were inclined towards these smaller hatchbacks and hence the monopoly. The situation had been similar since ages – no one can deny the supremacy of the A-segment cars in Indian Automotive Scenario since its inception. Padmini Premier, Maruti 800, Tata Indica, Hyundai Santro, Maruti Zen were some examples which had strongly heralded the growth of Automotive Industry in India. We expected the future to be similar – and then the wheels of fortune turned. Even though the A-segment cars were able to withhold volumes, they were losing their market share in the overall pie. Their numbers had suddenly stagnated and the effect was seen with an increase in the volumes of B and entry level C-segment cars. We saw the higher priced i20 consistently garnering more volumes than i10! Swift & Dzire now became the blue-eyed boys of Maruti Suzuki. Figo is successful in heralding the turnover story for Ford. 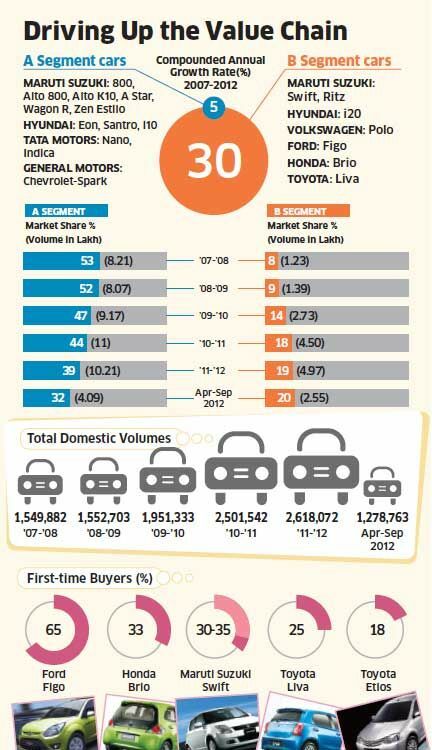 Brio allows Honda to experience 3 digit growth. A lot of this was sparked by the ‘dieselisation’ of the economy and also with the changing preference of the First Time Car Buyers. This segment was up for change and wouldn’t mind purchasing a pricier product offering which provided a better value. The rise in disposable income just reinforced the consumer psyche. It clearly signifies that even in the tight economic scenario, customers are open for product offerings which could provide a sense of excitement and value. Price is slowly losing its USP. No wonder luxury car manufacturers are undeterred by the slowdown and are able to perform well. The quote stands very suitable currently – ‘ADOPT OR DIE’. In the volatile scenario OEMs need to rise according to the customer requirements and change. · HAPPY FESTIVE SEASON! This statement stands true for almost all Auto OEMs in September. Although the figures are just indicative of the offtake numbers; but it does signify the increased confidence among both OEMs and dealers alike that the festive season would revive the sales figures in October. The month was also historic with the government taking the most difficult stand in its tenure – increasing the diesel prices by Rs.5! Yes, it may sound that the Congress wanted to divert the attention from Coal-block allocation to increased diesel prices. But the petrol dependant OEMs wouldn’t care – their wishes had come true! Increased diesel prices not only stood as a point of rationalization of fuel prices; but also indicated that the petrol-only models of the OEMs had a chance to regain their lost glory. The decreased interest rates also soothed the overall sentiments. · Maruti’s plight in past one and half years remind me of the bouncing ball that I used to play with in my younger days. The Automaker has seen tremendous twist and turns in the recent times and also witnessed the scariest labour issues of all times. If you believed your employer makes you slog and pays peanuts, read this – http://fountainink.in/?p=2660&all=1. However, the sales figures were a refreshing treat – Alto again rocketed to over 20k numbers; with the new Alto 800 coming in October 16 – see the numbers touching new heights in Oct. Ertiga, Eeco, Wagon R & Ritz saw their best sales numbers for the financial year. Ertiga numbers now seems to stabilize at 7k figures and have strategically placed Maruti in the highest-growing UV segment. The refreshed Ritz also soared its volumes and brings ‘JOY’ to the automaker! · SX4 & A-star emanate as the laggards from the Maruti’s stable. The numbers highlight the brands to be in their most difficult stage (Astar -71, SX4-288) and with Alto 800 coming in, I fear death for the A-star! The Kizashi numbers were a delight though J With Manesar production running in full swing, be sure about the consistent numbers for Swift & Dzire as well in Oct.
· Someone just recently mentioned that Mahindra is the Maruti of the UV segment – and that aptly describes the automaker! M&M again pips Tata Motors from the third position and joins the Top-3 bandwagon yet again!!! All thanks to the most loved SUV in the recent times – XUV5oo which celebrated its first anniversary on Sep 28th. The brand has now consistently overtaken Scorpio volumes and yet commands a long waiting period currently. The concern still remains the most spacious UV in the Indian market today – the Xylo. It stepped below 2k figures for the first time in past 8 months. You can either “Quanti”fy the decrease or ignore it – but M&M needs to regain the lost ground with Evalia and a host of MUV’s to be launched (Enjoy, Stile, Lodgy etc) ready to put to a stiff competition. · The Quanto figures remained encouraging – with offtake of 1782 numbers within 10 days of its launch (Sep 21). It also has registered 3200 bookings in the short span! · One can predict the increase in diesel prices just by seeing i10 figures overtake i20 numbers J Hyundai also saw an boost Santro, i10 & Eon numbers amidst the rationalization of fuel prices. But the surprise from Hyundai was its Elantra sales – it consistently registers a 600+ offtake (781) and strengthens Hyundai’s foothold in the premium category. The brand has proved to be an intelligent choice since the success of the fluidic Verna. · There’s nothing working right for Tata now. With Ex-Chevy chief Karl Slym moving in, we expect some major positive turn around for the automaker. October has also been touted as the month of major launches (read the new Safari Storme, new Manza club class, refreshed eV2, pepped up Vista)!!! · The most important highlight of Sep’12 sales remain the kingmaker from Renault’s stable – the brand which has dusted up a new storm – THE DUSTER! With 4211 numbers, it has outdone the most established SUV in the category – the mighty muscular Scorpio. And with over 20,000 bookings currently the brand is in a very comfortable stage to sustain its volumes. The confidence is also apparent from the price hike of Rs.30k-40k in October. · The newly launched Scala also performs decent for Renault with 688 numbers. It however brought down the Sunny numbers in Sep (from 2757 in Aug to 2023 in Sep). The platform sharing model somehow is not working for the two OEMs. Hope they do not repeat their mistake by re-badging Duster under Nissan. · The mega advertising campaign by VW (vibrating ad, mobility max, TV commercials) seemed to have resulted in a slight increase in the overall figures (4397 in Aug to 5170 in Sep). · Toyota Liva & Etios encountered their ever lowest figures. Toyota seemed to have contradicted their ‘promise’ of quality with the aforementioned models and hence the outcome. Although the much higher priced offerings – Innova & Fortuner continue their gold run. · I somehow love the consistency of Ambassador sales. The old workhorse from the Hindustan Motors stable always has a ~200 figures – maybe a government order is equally divided throughout the year. Yes! You heard it right. ‘UV’ology is the new subject which has surprised the industry experts and has amazed the OEMs. At the same time previous year we all were talking about how an OEM can gain supremacy in the Indian market by having a product in the low cost hatchback segment. Industry was abuzz with the launch of Eon and possible launches in the same segment by Bajaj, GM, Ford, Toyota etc.. The dynamics of the Industry changed overnight with the increased petrol prices, lower consumer sentiments and increased interest rates. Suddenly the petrol cars were finding no buyers and with the labor unrest in Maruti, the automobile scenario in India was on the brink of a major downfall. Even in the most adverse conditions, SUV’s & MUV’s have grown against the market expectations. On a lighter note the answer is – “Because it has Yuvi (UV) in it!”. As our Yuvi, Yuvraj Singh fought the deadly cancer and hopped back to the Indian team; the UV’s have proved their mettle in the diseased economic scene. The radical change is not overnight due to the increase/difference in petrol prices in comparison to diesel. The basic reason is the evolution of the Indian customer. The number of kilometres usage has increased, the normal Indian car buyer also wants to go on an outing with his family/friends once in a while, accommodation of more people within the car matters. The icing on the cake is when you get all these within your budget and then with an attractive mileage! No wonder Ertiga has over 35k bookings, Duster with over 16k bookings and XUV500 with over 15k bookings as of now. The customer purchase trend is justified. We Indians love to travel and also love to take the world with us! This has motivated the average Indian car buyer to look for bigger and powerful machines. SUV’s & MUV’s now constitute to nearly 20% of the passenger car market! It has grown from meager 14% four years back. The Indian Car market is now dominated by OEM’s who have a good offering in UV space. M&M recently pipped Tata as the third biggest passenger car maker because of its growth with its increase in XUV500 sales. Even Ertiga emerges to be the most ‘LUV’ed MUV – within 6 months of its inception it becomes the 6th highest selling passenger car in India. In August’12 Renault India overtakes Nissan & Skoda both (in terms of overall sales numbers) primarily due to the success of its SUV offering Duster (offtake of 3184 units!). This has now forced other OEMs to bring a product in SUV/MPV category and hence be in the race. The upcoming product launches are the testimony of the above statement. Even the luxury car makers are eyeing the space. BMW & Audi already have their contenders in compact SUV space (X1 & Q3 respectively). They are now vouching for the Sports Tourer segment (you can call it as an entry level MUV space) – Mercedes Benz have already showcased its product offering – the B-class and is all set to launch this September. Even BMW is planning to introduce similar concept in the form of 1-series. VW is also considering to launch its Compact Crossover Vehicle (CUV) Tiguan in India – if priced well it can find many admirers too. So, ain’t the Indian ‘UV’ology interesting? · 2) It is agonizing to see the decline of the entry-level hatchs –name any and its sales figures would awe you with its downfall! The undisputed kingpin Alto suffers its greatest collapse till date (in my record of past 20 months!). Reason? Simple, because of yours and mine shift to diesel cars. Customer have just eliminated models only with petrol variants from their consideration set itself. Proof – Eon (5418 nos. ), Spark (530 nos. ), Estilo (828 nos. ), A-star (114 nos. ), i10 (6300 nos.) & Nano (607 nos). Once considered to be the most lucrative segment has questioned the dynamics of the market itself. India as a market is now one of the most difficult markets to crack! 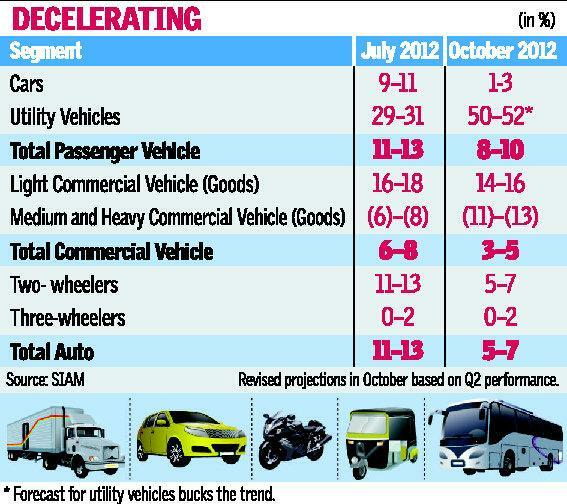 I’m waiting for the Diesel Nano – this could create some ripples and drive optimistic change in the segment. · 3) Bolero – the ultimate no.3. Just in July I’d predicted that Bolero would be in the top 2 list and the prediction seems to bear some positivity in the immediate month itself. The ruggedness and toughness is visible in the sales figure of the product as well. If I was asked 2 words to describe the brand – those would be “Consistent” & “Exceptional”. · 4) Mahindra seems to do magic again – the ‘refreshed’ Verito crossing 2k units! The offtake figure of 2102 units, is the highest for ‘Verito’ brand so far since its inception (even considering Logan). I wouldn’t be surprised to see it overtake the Xylo figures (2214 nos) as well in the coming months. · 5) Sales figure of Rs. 14-16L odd worth vehicles – Cruze: 337 units, Civic: 53 units, Elantra: 608 units, Fluence: 131 units, Laura: 168 units, Corolla: 492, Jetta: 342. Take this – offtake of XUV 5oo: 3979 units! The XUV oversells over 1500 units in consideration with all the vehicles in the similar price range combined! The vehicle is still enjoying a long waiting period and puts its premium sedan competitors to shame. However a special mention to the NEO-FLUIDIC Elantra – with 608 units it tops the list (beating the stalwarts Corolla & Cruze) in its second month itself! · 6) Duster flies with 3184 units! With this Renault has overtook Nissan and Skoda both (in terms of overall sales numbers). Duster has again highlighted the love for SUV’s among Indian car buyers. It’s compact space, butch looks and aggressive pricing has got it admirers and customers too. With rebadged Sunny – Scala waiting to take its first step on Sep 7, Renault seems to be hitting the right notes for now. · 7) Tata manages to resume its 3rd position again. But it seems a difficult ride for the Indian conglomerate. M&M is just over 1k units (1095 to be precise) behind Tata in overall volume. Indica & Nano proves to be the volume gainer for the company. · 8) Ertiga emerges to be the most ‘LUV’ed MUV. Within 6 months of its inception it is now the 6thhighest selling passenger car in India. No wonder Nissan, Chevy & Hyundai are eagerly waiting to launch their MUV offerings (Evalia, Enjoy & Hexaspace). · 9) August emerges as a delight month for Honda. Not only it tops the JDP Sales Satisfaction study scores (for F12), but also fares decent in City & Brio sales. However, I’m disappointed with the offtake of Jazz – 465 units is a dishonor for this wonderful product. People in Europe know it as “The Avante” and The Americans know it by something they have given it themselves “North American car of 2012” and we know it as Verna’s cousin – The Elantra. Going by its fluidic sculpture it looks Hyundai’s very much own kid. It has got everything in right proportions for a head turner. The sweeping layered headlamp looks like those in the Verna and is very attractive. The hexagonal front grill has now become the trademark of the fluidic design. On the rear too; the story is pretty similar with high waist line with a hint of curve down. The most peculiar thing about its looks is its tail lamp, sweeping all through its side like a water fall in to a river. It has got the best tail lamps in the segment category. On the outside the inspiration from Verna and Sonata like design has worked well but with the interiors it’s not the same story. It seems like their inspiration was Eon. Quite simply it looks like it has got stretched interiors from Eon. It’s catastrophic. Even the graphics on your instrument cluster are not either modern or pleasant. Just to make you feel special, India is the only country in the world to have a diesel motor option. Probably because without diesel it would have been like going to an Italian restaurant and asking for kebab. Because if you do that, Sonata will be the answer! Talking about what it gets underneath is the same motor from Verna and specs are pretty similar too; 126 horses of power and 260 NM of torque. The ride quality is really good, it nimble around like cheese. But it lacks something, something that has to do with the feeling of joy, something that you get while driving its competitors. Plus when you start cruising at high speeds and the going gets either fast or twisty its back starts waggling. And the good bit is that it comes loaded with features such as Automatic climate control with individual climate settings, ventilated front seats, electrically adjustable driver seat, cruise control, ESP and 6 air bags taking care about your safety. Real ac vents and music control are nice touches. The product is there with a combative price but surely we need more of that as far as marketing and promotions are concerned to make it the signature of success. The buzz is still not hitting the glass like it did in case of 3 series. Hyundai has a lot more to face in terms of Brand homage and fidelity of Toyota with the Altis and The canny speedster of the diesel-rocket Cruze along the persistence of Jetta and Laura waiting to compete. The segment has seen a slowdown in terms of numbers where the stalwarts such as Altis/Cruze are doing below average numbers. Will the new Elantra resurrect the fortunes of the segment and those of Hyundai? Only time will tell. There is so much do, words are just not enough! THE NEW ULTIMAT3 DRIVING MACHINE! BMW was very clear to go all guns with the new 3 series. With Audi challenging its leadership position, BMW had to present its ACE as an answer. There would no better time to launch the 6th gen 3-series. Since its inception in 1975, 3-series has been the most sold BMW of all time. With every edition the 3-series was generations ahead of its predecessor. The same stands true for the new 3-series. It is longer, wider and sharper – Hence, “Superior by Evolution”! With an absolute winner in hand BMW ensured that it doesn’t leave any stone unturned before its launch. An India Centric 360 degree campaign was designed & executed by Liquid Campaign India. German agency Contra & Weareflink were the production partners of Liquid Campaign India for the TVC. It was the first time in its presence in last 5 years the Bavarian Auto maker had tried something this big in India. Be it usage of QR codes, or a website to educate on the evolution or the teaser campaigns in print/media – it was magnanimous! The results were similar too – BMW received more than 500 bookings before the launch itself. Certainly the promotions have been outstanding; and the looks as well – with the chisel front headlamps it looks mesmerizingly brilliant. And of course since it’s a BMW you’d expect it to be a driver’s car – something that will put a big smile on your face when you press on the hammer. It’s a rare charisma of thrill and performance that only a few cars can make you feel like that. 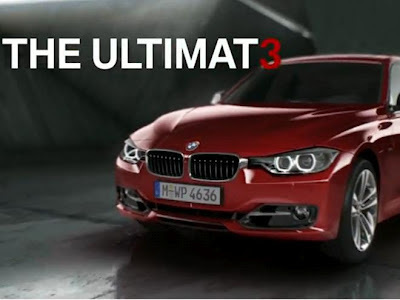 So with the new BMW 3 you expect it to take a leap forward from its predecessor. But looking at the old 3 series you would think how it could possibly be better. Talking about its performance and drivability you would expect it to be driver concentric. Since it’s a BMW, it’s meant to be a driver’s car in the first place. But here is a bit of smug for those who really want to throw it around corners and smoke some rubber as this new 3 series is way too smooth it’s actually like redefining comfort with the 8 speed gearbox. With 181 Bhp and lighter than the earlier 3 series it should be faster. Another ace is the brand ambassador – The God of cricket meets the goddess of power and speed. It is a match made in heaven which can’t get better. Do we really need more reasons? That is what BMW’s character is all about and 3 series is as iconic as ever. No car could ever produce a combination of luxury and performance the way BMW does! A 3 is a 3 – SH33R DRIVING PL3ASUR3! · 2) However, the positive for MS has been its LUV (Life Utility Vehicle) – Ertiga. It should be better named as LSV (Life Saving Vehicle – especially for Maruti!). Ertiga has clocked its highest offtake till date with 7091 numbers. It is growing stronger month-on-month and we wouldn’t be surprised to see it in the Top 5 within next 2 months. · 3) Eeco volumes have gone down scaringly low. It is appalling to see how a vehicle grossing an average of 4.5k numbers have come down to 930 nos! Even the A-star fares worse than the 800 (A-star: 583 nos vs Maruti 800: 1411 nos!). The real disappointment has been SX4 – 679 offtake for this capable product is just not digestable. · 4) Tata is seriously hurt – M&M overtaking Tata for the 3rd position in the passenger car market during June’12 is a stern indication on how Tata could lose its position if not acted quick. However, the response from Tata is satisfactory for the moment – Sumo Indica family & Indigo family contributing for the majority numbers. Sumo Gold has again been a trump card for Tata in gaining the numbers in UV segment. The hatchback & sedan market seems too volatile – Hence, would Tata be able to sustain with the Indica & Indigo productline? I assume not – with a new compact SUV from M&M on the cards, we wouldn’t be shocked to see M&M permanently overtaking Tata in passenger car market. The solidarity in SUV growth has also backed M&M as of now. · 5) Who could have predicted that Verna sale could be higher than Santro/Eon sales an year back! That exactly exhibits the shift in today’s consumer preference – a product can perform exceedingly well if it could exemplify “Value for money”. This holds true for vehicles in all categories! – Just imagine BMW bagging over 500 bookings for its new 3-series even before its launch.. Even Audi had achieved similar feat with its Q3 – achieved 500 booking within 5 days of its launch. · 6) One always wonders – where does all these Boleros go??? That’s the power of Rural India. Bolero never fails to impress us with its consistency. It would be the only product in the Indian Automotive history to date to exude such popularity & acceptance – the same is evident in its sales numbers, month-on-month! · 7) XUV500 in Top 20? YES! With production ramping up, don’t be surprised to see it surpass Scorpio’s number as well. With the opening of bookings all India, the product has garnered similar euphoria what it had achieved during its initial launch! · 8) Indians just love NOVELTY – don’t believe me? Then take this – 12000 bookings for the newly launched Duster. The love for SUVs has again gripped Indian consumers – Duster just hitting the sweet spot. The next challenge is to ramp up supply as per demand and also expand its (Renault) dealer network. · 9) Honda again is inconsistent – hence too difficult to rightly asses its performance. · 10) Skoda is on a spree to reduce its dealers stocks – the number exactly explains the point with over 50% degrowth M-o-M. However, Fabia is reeling to maintain required volumes – not deserved for a product this well. · 1) Alto back on top; but with a figure less than 30k doesn’t suit it. All thanks to the steepest hike in petrol a month back and also to the weak sentiments among the first time car buyers. But, does that effect Swift/Dzire – a big NO. Both the models with their Diesel variant is bringing the numbers for the company. I’m sure the way Dzire has got the response – if supplied well, would overtake Swift figures someday (we all know how value conscious Indian Market is!). WagonR with a mere ~10k numbers proves the point again – non-availability of a diesel variant can hamper the overall volumes. SX4, A-star & Estilo are almost on their ‘Decline’ stage – the sale of Maruti 800 is more than these models (with only BS3 available)! · 3) GM has lost its SPARK – quite literally! Even though being such a wonderful proposition Spark volumes remain a disappointment – whom to blame?? Obviously PETROL prices JWhereas Beat (diesel) has been the lifesaver for Chevy. · 4) It is very awkward to see the Tavera sale going down – right since the Neo BS4 has been launched! The availability of BS4 in Tavera was speculated to boost its volumes, not decrease it! · 5) There needs to be a serious re-structuring in the Sales Planning team of Honda! The company has seen the most irregular vehicle billing in the past 15 months. Hard to digest Jazz and Brio doing mere ~600 numbers. · 6) Scorpio numbers is the lowest in past 13 months! This has happened in a month where the mighty muscular celebrated its decade of dominance – its 10th Birthday. Verito numbers @ 444 leaves us thinking about the possibility of a new model coming in the future. XUV 500 puts the C+ sedans to shame with the numbers it’s achieving (in the same price point). · 7) i20 overtaking i10 sales – Possible? Surely YES! And that too with a hefty 1500 difference JReason – As mentioned earlier, thanks to our Petroleum Minister. And even the fluidic Verna is 240 odd numbers behind i10! · 8) Tata figures have nothing to talk about except disappointment. Aria does lesser than a only-petrol available CR-V. Indica & Indigo family has seen its worst performance in the year. Nano is still in its search of finding its true identity. The only breather remains Sumo which backed with Sumo Gold variant has done an average figure of over 2300 offtake. · 9) Did someone mention the uniqueness of the Indian Car Market??? If not then analyze this – Fabia numbers is lower than that of Laura & Rapid! And Rapid volumes is higher than that of its older sibling Vento! · 10) Nissan shines with its Sunny side again. Not to mention its excellent ~3000 offtake. · 11) In a country obsessed with mileage, Audi Q3 garners 500 bookings in just 5 days! With this Audi becomes the fastest growing luxury brand in India and also the world. The German luxury carmaker has reported a 43 per cent growth in sales during the first half of the year, with total sales of 4,000 cars in the January to June 2012 period. In the corresponding period last year, Audi India had clocked sales of 2,802 units.